Ultradense cosmic cannonballs used to tear around the universe, punching through regular galaxies like a bullet through candyfloss, going their own way and heaven help whatever got in their way – and scientists don't know where they are now. Luckily this is cosmology, not cinema, or the answer would be "Right behind you!" Because of the speed of light, staring into space is essentially looking back in time, and scientists have seen ultra-intense galaxies zipping around the first five billion years of existence. Similar in principle to the intense density of neutron stars ( a collapsed star with a core so dense that a single spoonful would weigh 200 billion pounds) these galaxies were a thousand times denser than regular star-scatterings, packing as much mass as the Milky Way into 0.1% of the volume and far before regular galaxies had time to form. 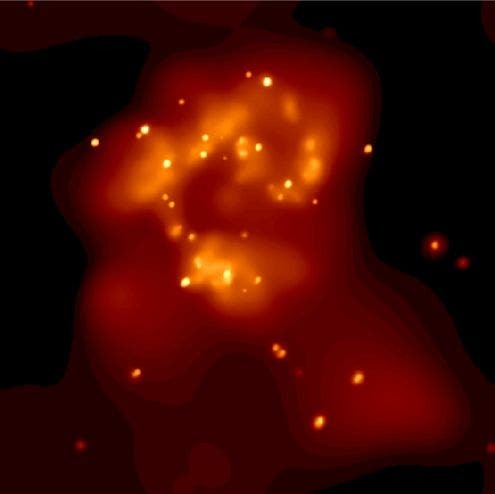 Scientists suspect that these objects collapsed directly from vast clouds of proto-star material, unlike regular galaxies which form by multiple mergers of smaller galaxies. But more important than where they came from is finding out where they went. Three hundred billion stars isn't the kind of thing you lose down the back of the sofa. It's unlikely they merged with other galaxies, since they'd punch through regular star collections like an armor-piercing round with only minimal effects on themselves, and collision with another ultra-dense galaxy would only create an even bigger wildly intense star selection. Other processes which could hide them, such as building up a diffuse gas cloud or expanding due to stellar detonations, would seem to take longer than the universe has actually had so far. Despite being awesome. Space. Every time we look there's something cooler.